I am delighted to be one of six bloggers asked to predict a key trend for 2015 as part of the Deramores Blog Competition 2015. Use any of the six trends as a starting point for your own blog post and submit it to Deramores for a chance to win a year's supply of yarn!!! Entry details can be found here and you can see the full list of bloggers and trends here. Since reviewing Laura Strutt's book I've seen arm- and finger- knitting projects popping up all over the place. I'm not sure if they were *always* around and I just hadn't noticed them (like when you get a new car and you keep seeing the same one everywhere) or whether this is something which is just becoming "mainstream" - my non-knitting friends are talking about it too, so this could be the case. Either way, I predict we will be seeing more of these simple-but-effective knits filtering through to the High Street for the Autumn/Winter season, and onto many craft blogs. You'll certainly be seeing more here as I'm in the process of putting together a finger-knitting necklace tutorial and will start arm knitting a project for the home (inspired by the picture above), just as soon as the yarn arrives. I can't wait! As the number of stitches must be limited to fit on your arms or digits, it is necessary to plan projects/designs accordingly. Arm-knitting is worked back-and-forth so the right side is always facing. This requires some changes to your knitting, for example you need to knit and purl alternate rows to make garter stitch. A remedial 'half-twist' is also necessary to prevent twisted stitches in the finished object. To put your work down, you will need to place the stitches onto a holder (eg a broom handle, or a gift-wrap roll in the case of arm knits). For this reason, it's probably not something to try while your kids are painting or the dog has muddy paws. Having a holder to hand also means you don't have to finish the project in one sitting. You still need to swatch! Choosing the right yarn and keeping the stitches tight is the key to having your arm-knitting look like lovely knitted fabric, and not like a net, but knitting too tight might cut off your circulation so it's a good idea to practice before starting a huge project. Finger knitting works in exactly the same way as using a lucet, you simply use fingers instead of the lucet prongs, but remember you're not limited to just two fingers. Find my lucet tutorial here. Although these projects are quick to finish, they can eat yarn at an alarming rate. I'll talk more about suitable yarns in future posts but think it's worth mentioning these techniques are also a good use for DIY Yarn. Find my tutorial on making yarn from a sheet here - the same method can be used to upcycle soft fabrics such as t-shirts. While these methods are relatively straight-forward it's worth taking the time to do a little research and practice before you begin. I've put together a shortlist of some of the resources I've been using, and which I would recommend for quality of instruction and presentation (there are lots of videos on YouTube, but the quality varies considerably so you'll need to hunt around). Book: Arm and Finger knitting by Laura Strutt. If you read my full and honest review you'll know I didn't love all of the arm-knit patterns but the instructions and photos are a really great introduction to these methods. As well as the arm knitting patterns there are some fun and practical finger-knit projects too - I really like those. Expert blogger: Anne Weil of Flax and Twine has a great 4-part tutorial for an arm-knit cowl on her blog (see below for a link to her online class which is where I discovered Anne). You can find the instalments, and download the PDF, here. 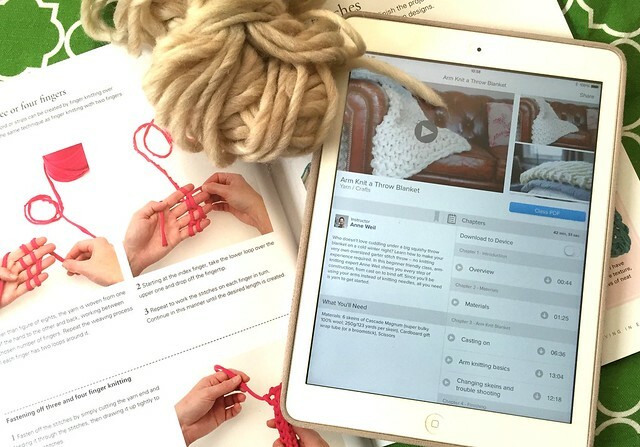 Online classes: Great video classes for finger knitting with Amelia Strader and arm knitting with Anne Weil can be found on Creativebug. These classes go into full detail and include trouble-shooting and lots of tips, working right the way through the project with you. If you are not a Creativebug subscriber, you can get an unlimited free trial for 14 days - see my review of the service for more information. So there you have it. I hope this post has given you food for thought and I look forward to reading your #DeramoresTrends posts! I'll post an update on my arm-knit project later this week.